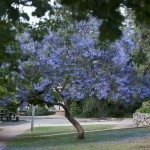 How many years after planting does it take for a Jacaranda tree to flower? Sandy soil area. If your tree is grown from a grafted stock it should bloom in 2 to 3 years. If it is a seed grown tree it can be 7 to 14 years. Here is a link about this spectacular tree.